Standard steam coils might also be termed “u-bend” steam coils. For the most part, they look like a hot water coil in that they have two headers, one for the steam supply and one for the condensate return. Frequently the connection on the supply header will be halfway up the header whereas on a hot water coil the supply will usually be at the bottom of the header. The condensate connection must be at the very bottom of the return header in order to not trap steam inside the header. 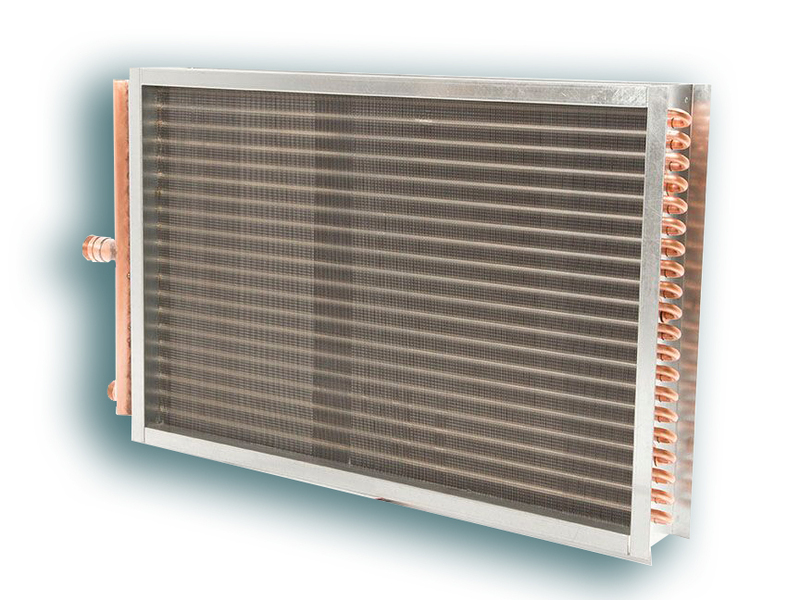 Assuming that the supply and condensate connections are both on the same side, the end of the coil opposite the headers will have return bends just like a water coil. For commercial applications, the most commonly used tube material is copper, and there are a variety of tube wall thickness options to handle different applications. We recommend a minimum tube wall of .025” copper for good coil longevity. Aluminum is the most commonly used material for the fins on a coil, because of good heat transfer characteristics and low cost. There are many different fin designs that will either enhance heat transfer or reduce air pressure drop, depending on the requirement. Coil frames (or casings, flanges, whatever you might call them) are normally galvanized. Coil connections are typically copper, steel, or brass. Keep in mind that although there are a huge variety of material options available for coil designs, unless there is a design reason to specify something special, most coils will be purchased based on the cost alone, so using the “standard” coil material is generally the approach to take.